Toast with butter, PB&J, or avocado. Pop tarts in your choice of "flavours". Bright colours, totally adorable stamps and an interactive surprise. This class has it ALL. 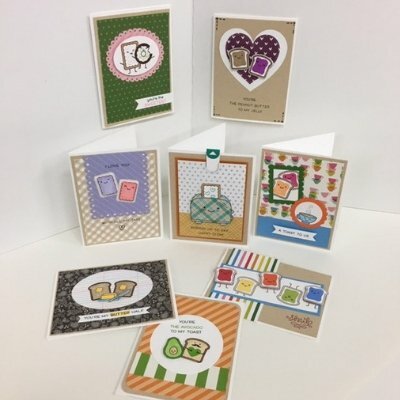 Come and make 8 super cute cards good for any occasion, especially to celebrate friendships or your "butter" half. Colouring is simple and no homework will be required. Requirements: Please bring your basic tools, including colouring tools (pens, markers, pencil crayons - your choice). You will also need your adhesives including 3D Foam tape/dots/squares.